Eyre Chapel was restored by the Chesterfield Civic Society in 1987 after many years of neglect and deterioration, and is now a grade II* listed building. 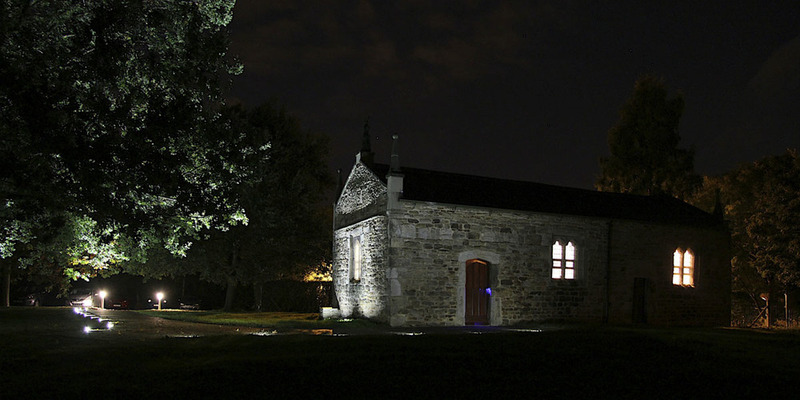 MAD architects llp have worked with the Trustees of Eyre Chapel to develop a lighting scheme which is sympathetic to the historic nature of the building, replacing the existing floodlights fixed to the building. The scheme utilises subtle lighting, from ground recessed lights to provide a wash of light across the existing path, with additional recessed uplighters to illuminate the main facade of the chapel and the cross in the grounds. The scheme offers a sympathetic, yet dramatic addition to the premises which serves both functionally to improve the safe access and egress to the building, and aesthetically to highlight the features of the listed building and grounds.